Covering your ceiling with wallpaper is a fantastic way to add color and pattern to virtually any room in your home. Pre-pasted wallpaper has an adhesive backing. You will need a damp sponge to activate the glue. Paste the wall wallpaper as the name implies, is installed by applying the glue to the wall and not the paper. Many people prefer this method because the wet paste makes it easy to slide the wallpaper into its final position. Peel-and-stick wallpaper is reusable. To install, remove the paper's backing a foot at a time as you smooth the wallpaper into place. Remember to save the wallpaper's backing if you plan on reusing the wallpaper. To remove all three types of wallpaper, just dampen a corner with water and slowly peel off. Before you decorate your fifth wall take a gander at these 29 ceiling wallpaper ideas. In this 275 square foot New York City apartment spotted on 6sqft, there is a ceiling covered in custom peel and stick wallpaper. These days, anyone can design wallpaper. Our two favorite sites for custom, on-demand wallpaper are Spoonflower and Detroit Wallpaper. You will need to create a repeating pattern in a TIF, JPG, PNG, or GIF format. Jenny Wolf Interiors based in New York gave this white bathroom some star power with a ceiling covered in Coronata Star wallpaper by Osborne and Little. The best wallpaper for wet spaces should be highly water resistant. When the charming duo behind Mr. Kate purchased their first home, the first order of business was fixing up the old dining room. They consider their new dining room ceiling a chic work of art thanks to an interstellar wallpaper pattern by Calico called Lunaris II. Moonscape photography by NASA inspired the wallpaper's out this world design. Elizabeth Gordon Studio, an architectural interior design firm based in Los Angeles, California gave a recessed detail in this ceiling some pizazz with metallic wallpaper. The frosting on this proverbial cupcake is the gold Flame Flushmount light fixture by Global Views. Who needs a fancy foyer when you can have a hardworking mudroom that is incredibly stylish. Case in point, this space by In Site Designs based in Greenville, South Carolina. Topping things off are the metallic, Moroccan print wallpaper and the Star Pendant Chandelier by Griege Design. The design team at Laura U Interior Design based in Houston, Texas love sprucing up ceilings with wallpaper. In this dining room, they recently designed an eye-catching floral wallpaper lends drama. The best custom spaces for teens let their personalities shine. One of our favorite examples is this teenage bedroom by Fletcher Rhodes Interior Design based in Sonoma California. On the ceiling is a whimsical heart-patterned wallpaper that adds a big dose of adorable character. Of course, white kitchens are here to stay. But blue kitchens also have enduring style. Archer Buchanan Architecture based in Philadelphia, Pennsylvania takes things to the next level in this blue butler's kitchen. The star patterned wallpaper on the ceiling is by Osborne and Little. This particular wallpaper is washable making it perfect for kitchens and other hardworking spaces. You can make a cramped room feel more spacious by raising the ceiling — or you could install wallpaper. Jenny Wolf Interiors did just that in this attic bedroom. Covering all five walls in the same wallpaper pattern creates the illusion of height. There are a few smart decorating tricks worth mentioning in this chic kitchen by interior designer Brian Patrick Flynn based in Los Angeles. The pendant lights are bushel baskets repurposed as shades. The electrical cords for the fixtures are wrapped in rope for a chic coastal look. The wallpapered ceiling brings pattern and contrasting color. Spice up a white room with this idea by Amy Elbaum Designs based in New York City. The patterned wallpaper on the ceiling adds visual interest to the neutral nursery. Purple is indeed a brilliant hue — not to mention it is the color of the year for 2018. The interior design firm, Mayme Baker Studio based in Greenville, South Carolina combines two different patterned wallpapers featuring various shades of violet to create a statement-making powder room. Fake the look of a reclaimed wood ceiling with eco-friendly wallpaper. Autumn Clemons is the Utah based interior designer behind My Design Dump. She created this space for a client with a shoestring budget. Most of the décor came from big box stores including Home Depot and Target. The whitewashed wood wallpaper on the ceiling is by Sure Strip. The vinyl free wallcovering is made with water-based inks. We get it — not everyone can afford to wallpaper a ceiling. This idea by Kristen F. Davis Designs based in Atlanta, Georgia shares how to fake it with a stencil and paint. The owners of this contemporary townhouse wanted a modern space that put their art collection front and center. Greg Natale Design Studio based in Australia designed this living room around the David Bowie print over the sofa. The gold zigzag wallpaper on the ceiling ties into the pink and blue thunderbolt. Kelly Deck Design created this contemporary home office for a fashion-forward client. The patterned wallpaper on the ceiling beautifully frames The Sputnik Chandelier by Jonathan Adler. Katherine Carter an interior designer based in Los Angeles transformed the dining room in this 1921 Tudor Revival with colorful wallpaper. The pattern features hundreds of butterflies that contrast beautifully with the marble dining table. This modernist inspired dining room by Hacin and Associates based in Boston, Massachusetts combines wallpaper in a traditional pattern with stunning walnut and brass chairs, and a sleek, white dining table. 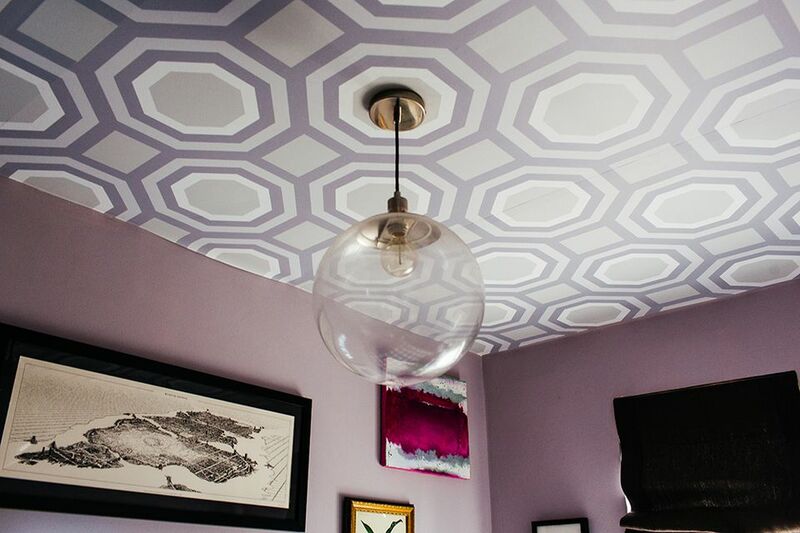 Patterned wallpaper on the ceiling adds character to spaces that lack architectural details such as crown molding. A, for instance, is this nursery by Crystal Sinclair Interior Design based in San Antonio, Texas. Punching up the cookie cutter room is bold black and white wallpaper. Grace Mitchell, from the blog A Storied Style, created this space in her home dubbed the spoon room. The small nook is a hallway between her kitchen and dining room. On the four walls are actual spoons. She picked them all up at a local garage sale for $10 — many of them turned out to be silver! On the ceiling is a retro-inspired wallpaper by Studio Ditte called Teaspoons. The pattern is an Anthropology exclusive. We adore colorful spaces like this child's bedroom in a Brooklyn townhouse by Bella Mancini Design based in New York City. On the ceiling is royal blue speckle wallpaper by Chasing Paper. Show an angled ceiling some love with wallpaper. In this Brooklyn, New York townhouse by CWB Architects, a small attic gets a new life as a bedroom. Wallpaper in a pattern called Woods by Cole and Sons was installed just on the angled portions of the ceiling. If wallpapering an entire ceiling sounds like hard work, behold this easy solution by Lindye Galloway Interiors based in Orange County, California. Here the design team added a little glitz to an attic bedroom with gold wall decals. The round, peel and stick decals are much easier to install than long sheets of wallpaper. You will find stickers like these on Etsy. Malcolm Duffin Interior Design based in Scotland perked up this tiny white bathroom with colorful wallpaper by Cole and Son. Called Circus, the wallpaper features a striking harlequin pattern. Rethink Design Studio based in Savannah, Georgia gave this century-old townhouse some modern edge. On the living room ceiling is a textured wallpaper in charcoal gray. It brings a little pattern to the large room without upstaging the rest of the décor. James Dawson Interior Design based in Australia created the layout for the bold wallpaper over the kitchen area. First, the pattern was hand drawn on to the ceiling. Afterward, the wallpaper was cut into the same shapes and hung on the fifth wall. A wallpapered ceiling can give a bedroom a soothing vibe. A pitch-perfect example is this lovely modern farmhouse-inspired space by House of Jade Interiors based in Utah. The bird-patterned wallpaper called Ocean Flight in Overcast by Willow Lane Textiles sets the calm tone. Add drama to a room with large-scale floral wallpaper. In this home office by Steele Street Studio based in Orlando, Florida, wallpaper called Dark Floral by Ellie takes things to a chic, new level. Paintings from the Dutch Golden Age inspired the dramatic pattern. We love everything in this colorful kitchen by Janet Gridley Interior Design based in Dallas, Texas. On the ceiling is a striking pink geometric patterned wallpaper. The floor features a custom paint job. Four clear, polycarbonate chairs surround the tulip table by Knoll. The yellow kitchen range is by Bertazzoni.